Alright, is anyone else slightly freaking out the July 4th is less than two weeks away?! I kind of feel like once July 4th is here, we blink and it’s already Christmas LOL (but really). Regardless though, July 4th has always been one of my favorite holidays because nothing says summer like watermelon and sunshine and and boat rides with family and friends. Since blue and white is such a huge trend this summer, you should have no problem shopping for july 4th outfits! 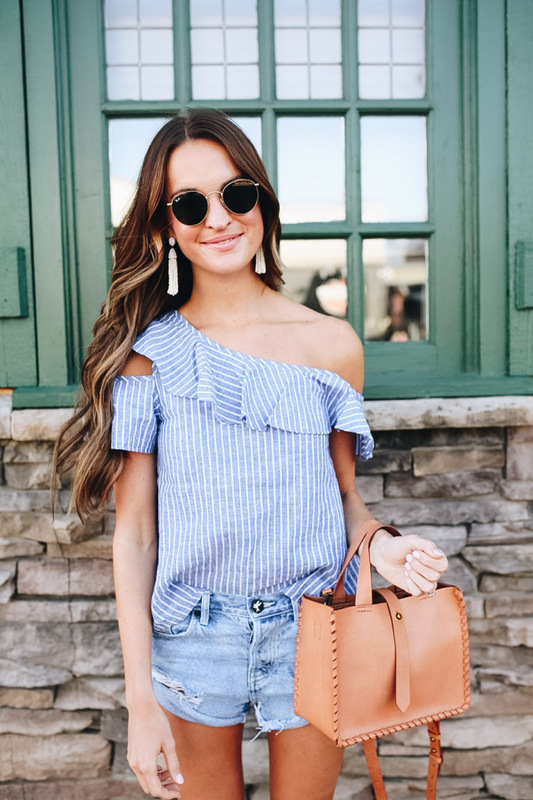 Just in case the blue and white stripe trend isn’t your thing though, I wanted to round up tons of different July 4th outfits for you guys! Do y’all have plans for the 4th yet? As far as I know, I think Michael and I are staying in Boulder so it will probably be pretty chill…but most definitely involve grilling out and eating watermelon! Hope y’all have a great weekend y’all! One of my fav tops too!! I hope this is the right post! What is the one thing you can’t resist buying when you find it? What do you currently have too much of in your closet? This outfit is beyond adorable and I L O V E that purse! It is the perfect color and it looks like it can hold a lot! Is it one of your favorites? !